There is a narrow band of light snow across the southern Red River Valley this morning. This will slowly work south today. Additional accumulations under 1 inch expected from this band and with temperatures near or above freezing where this snow is falling, the accumulations will be mainly in the grassy areas. Temperatures today are expected to change very little from the current temperatures, meaning locations in the Red River Valley will likely stay near the freezing point throughout the day and other locations remaining in the 20s. 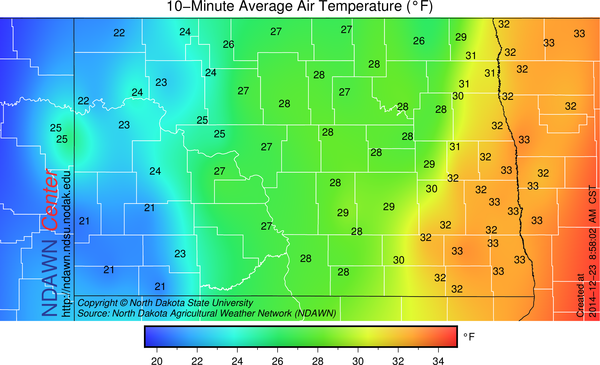 Even though on Doppler the main precipitation was the band of snow in the southern Red River Valley moving gradually southward, there are other area getting freezing mist and or drizzle in the colder air that will hamper travel. You can always dial 511 for the latest road conditions. The snow band in the southern Red River Valley will not only move slowly south and east, but will also just fade away as the storm focuses the moisture farther to our east. This should keep the accumulations down. 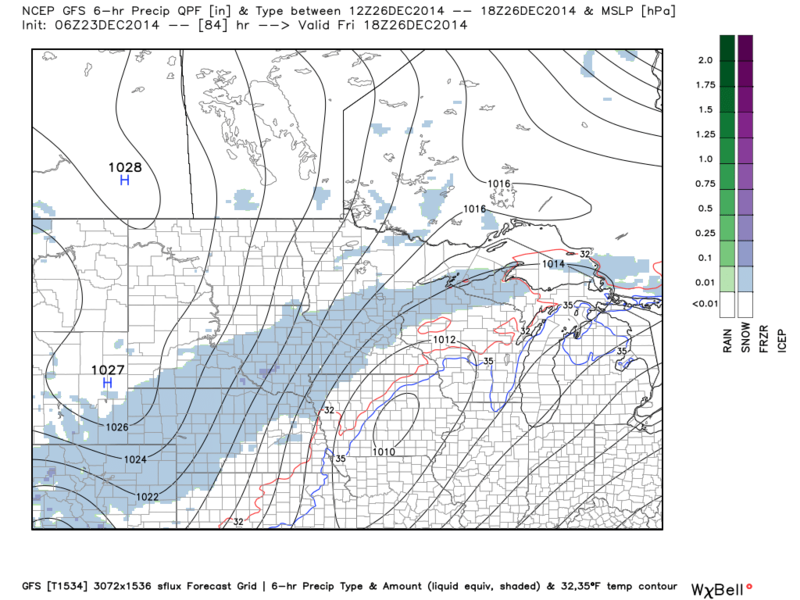 After today’s event, the next threat of snow looks to be on Friday. Projected Radar and precipitation type for today. Indications are that most of this moisture may stay in South Dakota and southern Minnesota, but I would not be surprised if locations near and south of Interstate 94 also see at least some snow fall, albeit, probably quite light. After the Friday event it may be early next week for another chance of snow. Projected Weather Map for Friday, December 26. With minimal snow expected in the next 10 days, the one weather feature most noticeable will be the colder air that will be moving back into the region. Below is the temperature from average for temperatures around 4000 feet for next week. This should translate to temperature 5 to 10 degrees next week. Not bitterly cold, but certainly a change over what we have been experiencing as of late. 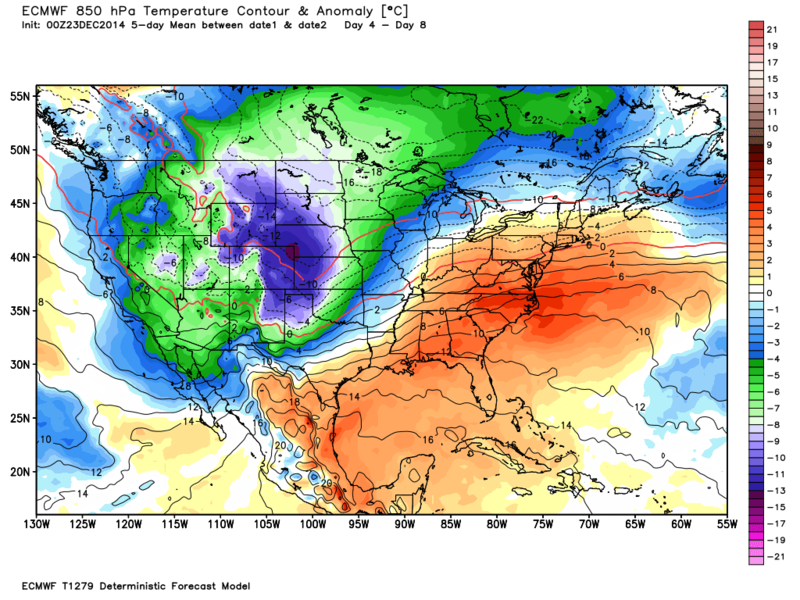 Temperature Anomaly at 850 mb center on Wednesday December 31. So 2014 will end cold, but with the temperature so far this month being so mild, December 2014 will end up being one of the rare months this year to finish with above average temperatures.